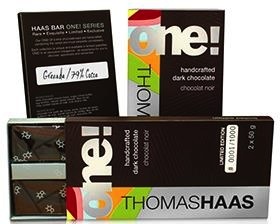 The latest edition of the Thomas Haas lineup of handcrafted chocolate bars can truly be described as the ONE! and only. Sourced from a select parcel of wild-foraged cocoa beans from Grenada, Thomas Haas’ new 79 per cent Grand Cru cocoa ONE! Bar will be available for a short time only as part of a limited release of 1,000. It’s a perfect union of exclusivity and creativity: Haas is the only chocolatier in Canada and one of only a handful worldwide to have access to this unique and robust vintage of 65 per cent cocoa from Valrhona’s prestigious Sourcer’s Selection. To refine the bar even further, Haas has intensified the flavour profile to 79 per cent using a unique blend of 100 per cent pure cocoa — this bar truly is a one-of-a-kind indulgence for the senses. Available at the two Thomas Haas cafés in North Vancouver and Kitsilano and select high-end retailers, the ONE! Bar is a limited-edition member of the “cocoa percentage” family of high-quality chocolate bars handcrafted by Haas and his team with a singular focus on cocoa origin and purity. Priced at $11.75 and arriving on store shelves byOct. 22, 2013, each box of two 50-gram bars is adorned with a uniquely numbered stamp and emblazoned with the full colour palette that distinguishes the Thomas Haas range of chocolate and confectionery selections. This is the first in a series of ONE! Bars with two limited edition releases planned per year. Because of the varying cost of the cocoa depending on origin and yield, the price of the ONE! Bar will fluctuate by batch, likely between $11-$14. In the spirit of the Thomas Haas annual charitable Easter Egg raffle, chocolate lovers will have a chance to win the very first ONE! Bar produced, bearing serial number 0001 and an interactive chocolate experience with Thomas Haas. Thomas will welcome the winner and up to seven of his or her friends to his North Vancouver chocolate kitchen for a fun and interactive evening of chocolate making and tasting. Raffle tickets will be sold at both Thomas Haas cafés at the following rate: 3 for $5, 7 for $10, and 15 for $20 and will be randomly drawn on Dec. 3, 2013. One hundred per cent of the funds raised will be applied towards the purchase of toys for Thomas Haas’ longstanding charity of choice, the Canuck Place Children’s Hospice.